Well after nearly seventeen months and about fifty E Mails, I finally received my new Springfield Ultra Compact – High Capacity model PX9701L , 45 cal. handgun. When I originally placed my order, the pistol was shipped as a V10, stainless model but somewhere in time the factory changed my plans. 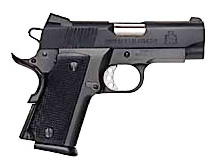 The new 2001 model is now shipped as a parkerized, non-ported pistol with Novak Low Mount sights. It’s the “FULLY LOADED” 45 caliber that has earned many kudos for Springfield over the years I have to admit I was a little surprised that it did not come with the new I.L.S. safety feature; the factory told me that the there was not enough space in the grip to support this safety, but a retro-fit should be available later according to the factory. The spec sheet says the weight is 32 oz. but I weighed mine and fully loaded (10 + 1)*, using 200g JHP’s and it came in at 42 oz. If you are interested in this hand gun as a concealed carry weapon, you’d better get a hefty pair of suspenders. This is my second Springfield. About a year ago, I purchased the V12 “FULL SIZED” Springfield model PX9151L, in stainless and it’s great. I am certainly not an expert or even a good shot, however in my opinion, this is the finest weapon I’ve seen, especially for the price. If you want a lot of fire power in a small package, this is the handgun to consider.